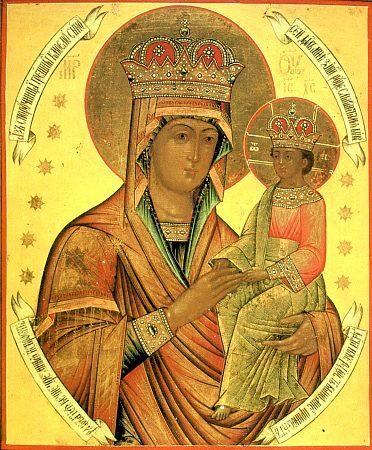 The Icon of the Mother of God – "Pledge for Sinners" ("Sporuchnitsa Greshnykh") – is called thus because of the inscription preserved on the icon: "I am a Pledge in trust for sinners to My Son...". This image was first glorified by miracles at the Nikolaevsk Odrina [BedChamber] men's monastery of the former Orlovsk governance in the mid-XIX Century. The ancient icon of the Mother of God "Pledge for Sinners" because of its old condition was not afforded the proper reverence and stood in an old chaplet at the monastery gates. But in 1843 it was revealed in vision-dreams to many of the people, that through the Prescience of God, the icon was embued with miraculous power. They solemnly conveyed the icon into the church. Believers began to throng to it in prayer for the healing of their sorrows and sicknesses. The first to receive healing was a crippled lad, the mother of whom prayed fervently before the icon. The icon was glorified in particular during the time of a cholera epidemic, when many fell deathly ill, and making their way to it, were by it restored to health. At the monastery in honour of the wonderworking image was built a large church with three altars. On the Icon "Pledge for Sinners", the Mother of God is depicted with the Christ-Child on Her left arm, Who with both His hands holds onto Her right hand. The heads of the Mother of God and the Christ-Child are set in crowns. In 1848, through the zeal of the Muscovite Dimitrii Boncheskul, a copy was made of the wonderworking image and placed in his home. Soon it was glorified as a source of curative myrh, given to many for restoration of health from grievous illnesses. They carried this wonderworking copy into a church of Saint Nicholas at Chamovnika, where then was built a chapel in honour of the Icon of the Mother of God "Pledge for Sinners". Besides 7 March, celebration of this icon is also made on 29 May.